The Physics of Spaceflight Series is a three-part video program which presents physics principles as they apply to spaceflight and space related events. The distinction between weight and mass becomes very apparent as astronauts move a satellite while in orbit. Examining the physics behind a Space Shuttle launch. The Gravity Assist Principle as utilized by the Voyager II spacecraft. Sampling of series, hover over image for description. The Physics of Spaceflight Series is a three-part video program which presents physics principles as they apply to spaceflight and space related events. The program’s photography was provided entirely by NASA, affording a great deal of spectacular footage accompanying the physics principles being illustrated. Computer animation and the use of graphics also assist in presenting physical concepts. The program was designed for use by high school physics classes and introductory level college physics courses. This program details the physics involved in launching a space vehicle. The Space Shuttle and Saturn V launches are dynamically examined in terms of the vehicle’s thrust, changing weight, net force, acceleration, and velocity throughout the initial stages of ascent and injection into orbit. The dynamics of launching a rocket from the earth’s surface is contrasted to the lift-off of the Lunar Module from the surface of the moon. The rocket engine principle is discussed in terms of Newton’s Third Law of Motion. Newton’s Second Law of Motion, expressed in terms of momentum, is used to find the magnitude of thrust produced by a single Space Shuttle main engine. Launch trajectories and the effect of the earth’s rotation on launching a rocket into orbit are also explained. This program focuses on the physics of orbital motion and re-entry into the earth’s atmosphere. The program discusses the dynamics of orbital motion and the apparent weightlessness experienced while in orbit. Kepler’s 3 laws of planetary motion are applied to satellites, explaining the characteristics of both circular and elliptical orbits. Orbital motion of the Space Shuttle is studied in terms of the acting gravitational centripetal force, orbital radius, and orbital velocity. 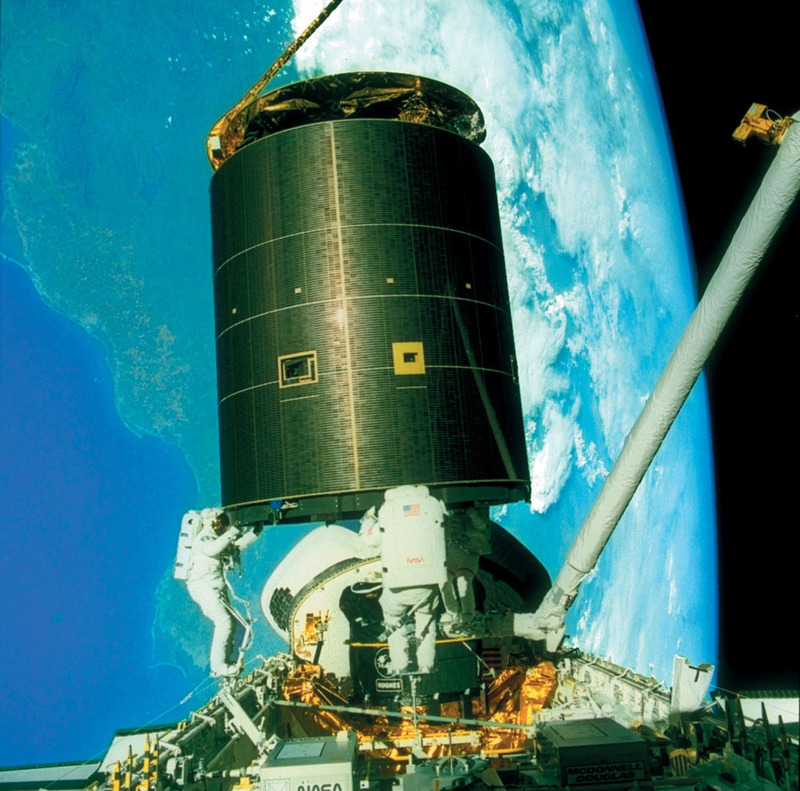 Satellite deployment from the Space Shuttle and subsequent attainment of geosynchronous orbit is also examined. The weightless environment provides a unique opportunity for motion studies in which Newton’s Three Laws of Motion become particularly apparent. Heat transfer in the vacuum of space and a discussion on thermal energy concludes the program as the atmospheric re-entry of the Space Shuttle is contrasted to that of the Apollo Command Module. This program centers on presenting a broadened perspective of gravity, with emphasis given to observing its influence in different environments. Newton’s Law of Universal Gravitation is used to determine the magnitude of the earth’s gravitational force at increasingly distant locations from its center; computer graphics are used to simulate pulling away from the earth with the inverse square curve graphically being developed. The microgravity environment is examined in terms of its effect on various physical properties and the unique mechanics it presents to orbiting space structures. Gravitational acceleration on the surface of the moon is contrasted to that of earth by observing experiments and events which took place during the moon walks of the Apollo Program. Finally, an examination of the Gravity Assist Principle, or “Slingshot Effect”, provides an intriguing example of utilizing gravitational forces to greatly accelerate spacecraft on their journey to the outer solar system.